When you think of Blondie, new wavey, dancey, reggae, quasi-rapping images usually come to mind. Don’t be fooled though, they knew how to rock it out too! With her unique voice and sassy attitude, Debbie Harry was made to front a band. She lets into it in “Call Me” and I absolutely love the guitar riff too! It’s one of those pulsing songs that gets you in the mood to do something, anything as soon as it comes on. It’s great music for driving or working out but not so great for sitting at your desk at work because it’ll make you want to flip your desk or push the copier over. 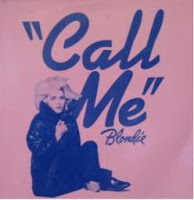 Steve Craig’s “House Of Retro Pleasure” radio show used to play Blondie all the time and I grew to really love them, especially “Call Me”. When I worked as a grill cook my friend Nathan and I would accompany the songs on the radio with whatever utensils we had around at the time. I played a mean double spatula and flat top grill drum part to “Call Me” and you should've heard Nathan’s sauce bowl bongos. Why we never put out a remix album I’ll never know! "Call Me” was from the bygone era when people would write songs specifically for movie soundtracks instead of just rehashing album cuts. If you wanted the song, the soundtrack was the only place you could get it. In this case, the soundtrack was for “American Gigolo” with Richard Gere. Ugh. Save yourself the misery, don’t watch the movie and just get the track off iTunes or Blondie’s Autoamerican reissue.